My FF has to do with my girl. She has issues with dairy and I’m not keen on giving her much dairy anyway, so thanks to a friend, I found soy yogurt! I have looked at the stores that I shop at but haven’t found it. The other Walmart carries it. It’s actually a lot less expensive than what I thought. It was $2.60 for a 6 pack. That’s a good deal! 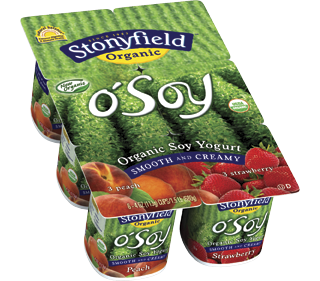 That’s cheaper than regular yogurt and it’s Organic. WAHOO! Abby had one tonight and loved it. Here is my princess up to date. 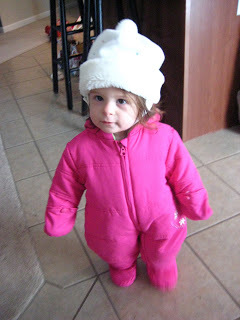 I put her snowsuit on for the first time this year. 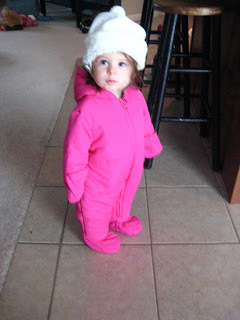 Here she is in her winter coat and black boots. 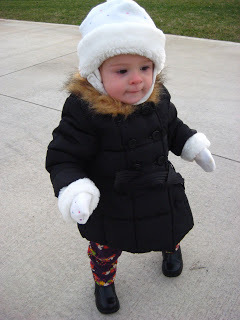 She had lots of fun walking/running down the street!